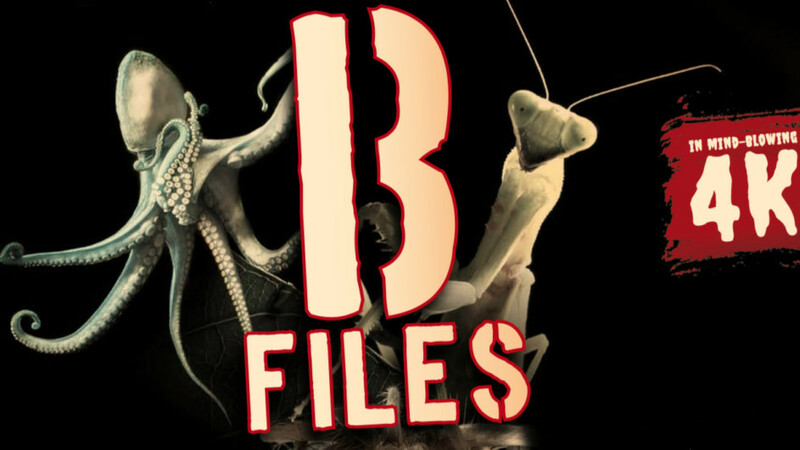 ‘The ‘B’ Files’ is a tongue-in-cheek series with a serious and relevant theme. It is a unique ‘field guide’ to a forgotten, ignored and misunderstood family of creatures that once brought chaos to the world. The lifespan of the ‘B’ monster was destined to be short. As audiences became more sophisticated, the monsters that once wielded terror were laughed off the screen. They were forgotten. In some instances, body parts were left to rot in old studios (the Blob was found in a bucket). Nowadays, the simple, inexpensive anatomy of the ‘B’ movie monsters cannot compete with the ‘A’ list computer-generated stars (transparent as they are). In presenting this unique series we explore the credible and the incredible – in the hope that laughter, fear and ignorance are not used as excuses to turn our backs on diversity ever again. The Blob, The Tingler, The Brain Eaters and Giant Leeches; now extinct monsters; were all related to ‘B’ animals. The Blob was a simple, jelly-like creature that became bigger with every human it swallowed – and then it swallowed an entire picture theatre! As horrible as this creature may seem, it has a living relative – the giant amoeba. Be prepared to watch a real life horror drama when this microscopic phenomena pursues and swallows its prey; then grows and grows and grows! The ‘B’ monsters are no longer with us, but their relatives are; the leeches and velvet worms – lovely little monsters of Nature’s underworld. It’s time to look upon them with the awe they deserve! Wasps, ants, cockroaches, bees, flies, grasshoppers – not so interesting? Too many legs? Wait until they become really big, then you’ll appreciate their incredible biology! In the 1950’s, radiation mutated them into outrageous giants with an appetite for humans. Perhaps it was the only way they could earn our respect. Them, The Monster from Green Hell, The Beginning of the End, The Beast from Haunted Cave, starred ‘B’ monsters that demand respect. They tried to kill us all, but we killed them first. In death they ask us to look again at the insignificant animals of the planet. Appreciate their unique abilities. We ignore them at our peril! The lungfish is a strange creature – breathes like a mammal, lives like a fish. It is the closet living relative of one of the most misunderstood of all ‘B’ monsters, the Creature from the Black Lagoon. Many scaley ‘B’ monsters appeared at the height of their diversification in the late 1950’s, to star in films like The Giant Gila Monster, Hideous Sun Demon, The Alligator People and The Snake Woman. They insisted that we look at unappealing members of the animal kingdom through new eyes; to have compassion for the unsighhtly, the cold-blooded and the reptilian; to accept that no matter how repulsive a creature may be, it has a right to live its life with dignity. Yeti’s, bigfoot, abominable snowmen, giant gorillas, wolfmen; hybrid human creatures, many straight out of mythology – the first ‘B’ monsters to evolve. There are still people who believe they exist. Mythical creatures have been discovered before. The giant squid was a sea legend until one was caught on film in 2006. And, for centuries, European explorers returning from Africa told stories of massive, hairy, man-beasts with immense strength. Early in the 20th century the monster was found and named – the mountain gorilla. The Abominable Snowman, Beast of Borneo, Captive Wild Woman, White Pongo and The Mad Monster, give a ray of hope that the ‘B’ monster lives! But, beware, while ‘B’ monster hunters continue their search, we turn our backs on the ‘B’ animals that we could save today! Jellyfish, barracuda, octopuses, molluscs and manta rays; ocean creatures that never get the ‘A’ list treatment; not as inspiring as a whale or a great white shark; but they are the closest extant relatives of a group of impressive and irrepressable ‘B’ monsters. Through the lives and tragic deaths of Zaat, The Sea Bat, The Monster from the Ocean floor and The Phantom from 10,000 Leagues, we can appreciate the true wonder of sea creatures capable of pulling down the Golden Gate Bridge or terrorising teenage beach parties. ‘B’ creatures from the sea show us how little we know about what lives below. In the 50’s and 60’s fear of the ‘other’ flourished. Cold War fears inspired visitations from outerspace. But the monsters who found their way to Earth were not completely alien. All of them evolved from creatures that actually exist. But none were welcomed. Creatures from Zontar, Monolith Monsters, It Came from Outer Space, 20 milllion Miles to Earth and Night of The Blood Beast give the same warning time after time. We kill what we do not understand.